I’ve come across a story close to my family’s about the illegal ways animal control steal peoples pets. Here is a petition with the family’s story. This seems to now be a common everyday thing and obviously needs stopped all over the united states. 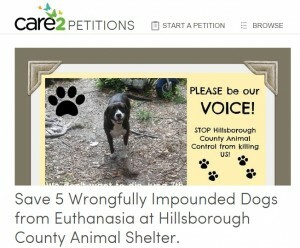 DON’T LET YOUR DOG BE THE NEXT VICTIM of Hillsborough County Animal Services! We are asking for your support to help us save the lives of 5 dogs that were wrongly confiscated and are currently impounded at the shelter. Case # C03161944. The dogs only have until June 7th to be saved from possible euthanasia. On May 28th, 2015, 5 dogs were confiscated from their secured gated property by Hillsborough County Animal Services. They were responding to a complaint of a 19 yr old girl that trespassed onto the gated property with signs stating NO TRESPASSING and BEWARE OF DOG. Buddy, the son of the property owner, saw her enter the property and he was telling her to stay out and he then fell. This was very alarming to his family dogs and they immediately began to protect Buddy. The trespasser, who caused this commotion, was bit by a dog and then she ran to the gate and jumped over it to flee the scene. Animal Services showed up at the property a couple days later. The property owner’s son went out to see what was happening and saw that one of his dogs was darted. Animal Services said they were taking all the dogs they think might have bitten the girl. They bullied Buddy, the son of the dogs owner, into signing a form without telling him what he was signing. Buddy got his sister on the phone and they told Sylvia that he HAD to sign the form. They never explained to Sylvia or Buddy that this form was to surrender all of the dogs to Animal Control. Buddy later found out that he had the right to refuse to sign it. Animal Services never spoke with the only witness to verify what happened and proceeded to seize the dogs without all the facts for their investigation. When the witness found out about the fate of the dogs, she, of her own will, contacted Animal Services to confirm her account of what happened because Animal Services failed to contact her directly. Even with this new information, the shelter said her statement did not matter, the dogs were already seized, property of Animal Services and they were going to keep them quarantined with the possibly of euthanasia on June 7th, 2015. Click here to finish reading the petition & sign it. Please share this with others you know as this will keep continuing until it’s stopped.